Newly uncovered fossils on an Indonesian island dating back hundreds of thousands of years might just resolve the mystery of the diminutive human species nicknamed the “Hobbit”. Scientists on Wednesday described bone fragments and teeth retrieved from an ancient riverbed that appear to belong to the extinct Hobbit species. The fossils are about 700,000 years old, extending the Hobbit story far backward from the original remains, which date to just 50,000 years ago, according to two studies published on Wednesday in the journal Nature. Known to scientists as Homo floresiensis, the Hobbits stood about 106cm, possessing a small, chimpanzee-sized brain and was previously known only from fossils and stone tools from a cave in Flores island. The new fossils, which were dug up in 2014, in grasslands nearly 70km east of the cave where the first Hobbit bones were discovered in 2003, bolster the theory that the Hobbits arrived on Flores island as a different, larger species of hominin, or early man, probably about a million years ago. And then, something very strange happened. These upright, tool-wielding humans shrank, generation after generation, until they were barely half their original weight and height. The process, called “island dwarfism,” was well known in animals, with some species shrinking as much as six fold in adapting to an environment with fewer resources. This is the first hard evidence of humans becoming smaller after being marooned on a spit of land transformed into an island by rising seas. “The Hobbit was real,” said Adam Brumm, an archaeologist at the Research Centre of Human Evolution at Griffith University in Queensland, Australia, and lead author of one of the studies. 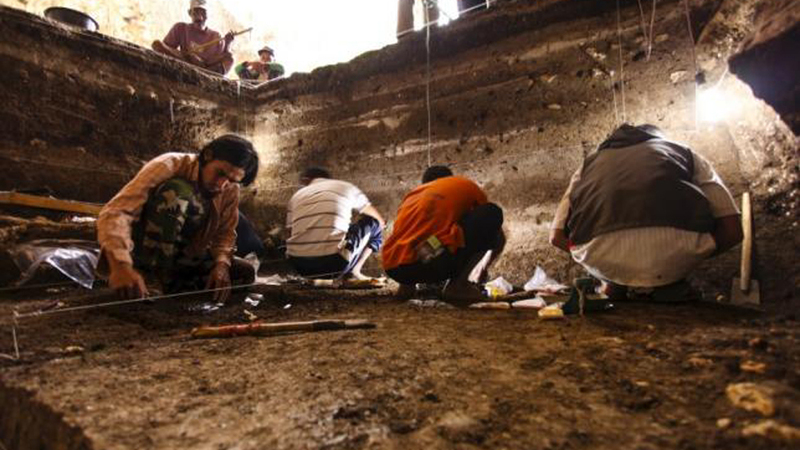 Gerrit van den Bergh, leader of the excavation and a palaeontologist from Australia’s University of Wollongong, said the new Flores fossils bear similarities to the Homo erectus fossils originally found on the Indonesian island of Java. The fossils included four adult and two baby teeth, a piece of jawbone and a cranial fragment from two children and either one or two adults who may have died in a volcanic eruption. The jawbone’s size suggested that the individual was even a bit smaller than the later cave remains. “It now appears that the Flores ‘Hobbit’ is indeed a dwarfed Homo erectus,” said Brumm. One theory that can now be set aside, the researchers said, is that Flores’ Hobbits were actually modern humans diminished by disease or genetic disorders. “This find quashes once and for all any doubters that believe Homo floresiensis was merely a sick Homo sapiens,” said van der Bergh. Most surprising was that the recently exhumed specimens were no larger than those still living on the island more than 600,000 years later. “I was stunned when I first saw these new fossils,” said co-author Yousuke Kaifu, a scientist at the National Museum of Nature and Science in Tokyo. Anything that old, he said, had been expected to resemble the bigger Homo erectus, or some other more primitive species. “What we found was a huge surprise,” added Brumm. An Asteroid With Explosive Power Of 3 Billion Atomic Bombs Barely Misses Earth!